Today my iTunes auto updater kicked in and something interesting popped up. 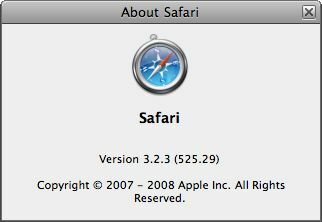 A new version of Safari for Windows. Last time I checked out Safari on Windows, browser was in some kind of early beta. Apple sure did improve it tremendously in mean time – it looks and it works like a real browser and it’s packed with features. My all time favorite Safari feature was a loading progress bar in background of url location input. Wohoo, that works under Windows now too. Apple really paid a lot of attention to details – they recreated crazy Safari input elements (which don’t go well with Vista theme), they replicated “falling windows” animation OS X style inside the configuration tabs etc. However, although I respect Apple for making such a nice Windows port, it just can’t beat superior speed of Google Chrome or extreme extendability of Mozilla Firefox. Safari on Windows is slow (checkout speed comparison) and it uses some crazy font smoothing engine that I just don’t dig. should i be testing sites on Google Chrome? Are a lot of people using it? @Ivan: As I PC user, I think OS X has more superior font smoothing than MS Clear Type. But this built in Safari, is neither one. @Fred: By statistics – very small amount of people. But basically, if your site works in FF and IE it sure will in Chrome too.